These are small stones, often looking like bits of gravel which form in the gallbladder. This is the collecting bag for bile, which helps us to digest fat, and is situated tucked under the liver just below the rib cage on the right. They are often present without causing symptoms, and it has been estimated that around 1 in 10 people in the UK have them, especially women, middle aged and overweight people. 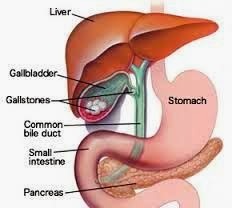 Gallstones are usually made up of cholesterol - the fat we eat in our diet as well as manufacturing ourselves - but can also consist of calcium and the products made from the break-up of red blood cells. It is unclear why some people appear to have a tendency to manufacture them (often over many years) but others do not. • Pain below the right ribs, often after eating a heavy or fatty meal, sometimes going round to the back near the right shoulder blade. • Sharp colicky pain, often with a high temperature. This suggests inflammation in the gallbladder (cholecystitis). • Going yellow (jaundice), which is a sign of bile obstruction. The urine usually goes dark and the motions turn pale at this time. The yellowness affects the whites of the eyes and the skin may turn a rather sallow yellow shade. Gallstones may cause regular attacks of symptoms or there may only be one episode in someone's life. Your GP will take a careful history and then examine your abdomen. You may be tender around your gallbladder, or have a slightly enlarged liver. Blood tests may be taken at the time looking for liver inflammation or signs of bile flow being blocked, and your doctor will usually arrange an ultrasound scan of your gallbladder. This is done at hospital and is the same sort of painless ultrasound that pregnant ladies have. It will show up any gallstones or other blockages around the gallbladder and liver area. What Treatment Might I need For Gallstones? 1. Laparoscopic, or keyhole surgery. This is now the treatment of choice, and only very small incisions are needed in the abdomen. Most people need to stay in hospital for one or two nights and can return to work within two to three weeks. 2. Open Surgery: For some people, especially very large patients a more traditional operation is needed, with a larger cut along the abdomen. This involves a longer stay in hospital - of around six to seven days usually - and an antibiotic drip after the operation. There may be slightly more discomfort after this type of operation than the keyhole surgery. In both cases, both the gallbladder and stones are removed. It is completely safe to live without your gallbladder, and bile continues to be produced into the bowel when it is needed. If a gallstone is stuck in one of the tubes leading to the bowel, another procedure can be done, called an ERCP. This is where a fibreoptic endoscope is passed through the mouth and stomach under sedation, and removes the trapped stones. In this case, the gallbladder is not removed. Very occasionally your doctor may suggest using medicines to try and dissolve your gallstones but these have a variable effectiveness and need to be taken for many months before any effect occurs. Most people need no intervention for the occasional gallstone problems they experience. If gallstones are left alone because they are causing no symptoms they cause no other long-term problems. Losing weight may be enough to greatly reduce symptoms. A low-fat diet often helps, and any food which causes symptoms - usually fatty or oily foods - should be avoided. Alcohol should be drunk very sparingly if at all. After a gallbladder operation it is still sensible to keep your intake of fat in your diet to a minimum but most people find they are able to eat what they like. Your intake of alcohol can return to the approved sensible levels post-operatively (21 units a week for men, 14 for women with one unit being half a pint of beer, a glass of wine or a single spirit measure). 1. Are your symptoms linked to eating or any particular food? 2. Do you have any pain in your back or around your shoulder blades? 3. Does the pain make you want to lie still or move about? 4. Have you had similar symptoms before? 5. Have you ever gone yellow? 1. Can I still take the contraceptive pill? 2. Are my children more at risk of having gallstones? 3. Am I more at risk of other stones such as kidney stones? 4. What are the risks involved with having an ERCP? 5. If I have only had an occasional, but severe attack of pain, do I need my gallstones removed?